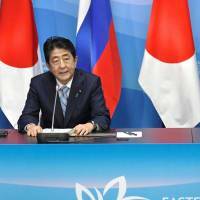 VLADIVOSTOK, RUSSIA - Although Prime Minister Shinzo Abe and Russian President Vladimir Putin diverged in their approaches to reining in North Korea’s nuclear ambitions at their summit Thursday, it wasn’t all bad news for the Japanese leader. For Abe, the urgency of addressing North Korea provided a welcome distraction from the limited progress made in solving their territorial dispute and lack of a postwar peace treaty, analysts say. Abe is pinning his hopes on joint economic activities on the Russia-held, Japan-claimed islands off Hokkaido to pave the way for resolving the territorial dispute, but there was little sign of progress at Thursday’s summit. 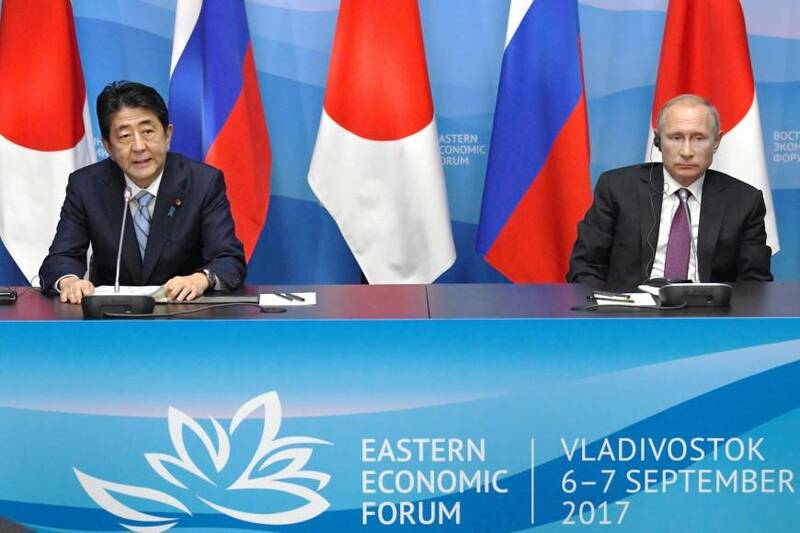 Abe said he agreed with Putin to start joint activities on the islands in five areas, including tourism and aquaculture. “It’s important that we show that the joint economic activities are making visible progress,” a Japanese government source said before the meeting. Still, it is uncertain whether the activities can be launched without compromising the countries’ respective legal stances. And even if they do take shape, the question of how they will lead to solving the territorial issue remains unanswered, analysts say. While talking at length about economic cooperation at the news conference, Putin made only a brief reference to the peace treaty and ignored the territorial dispute completely. “In a way North Korea could be, slightly, the savior for Abe’s policy, because if the focus of the meeting is about the two talking about North Korea, then some of the focus would be away from the joint economic activities,” said James Brown, an associate professor at Temple University in Japan. 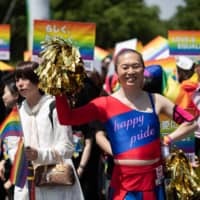 “Abe finds himself in a difficult position as he has invested so much in the relationship with Russia that I think the Russian side knows he can’t reverse from his position. 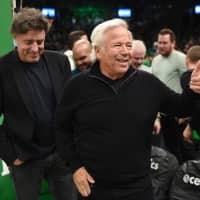 He has emphasized ties with Russia for so long that he almost can’t abandon it, he has sort of trapped himself,” Brown said. Thursday’s summit was the leaders’ third this year and 19th overall. They agreed to meet again in November and May next year. While Abe’s meetings with Putin usually focus on the territorial dispute, North Korea took center stage, with the latest meeting coming shortly after Pyongyang’s sixth nuclear test on Sunday — just five days after it launched a ballistic missile that flew over northern Japan. 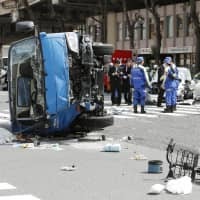 Japan, along with its security ally the United States, is trying to put more pressure on North Korea to abandon its nuclear and missile programs through the adoption of a fresh, tougher sanctions resolution at the U.N. Security Council, possibly including an oil embargo. To that aim the support of Russia, one of the five veto-wielding permanent members of the powerful U.N. body, is essential. As Russia also has economic ties with North Korea — it supplies oil to the North and takes in its laborers — its cooperation is key to putting more pressure on Pyongyang. Abe sees close communication with Putin on North Korean issues as a priority and, with the U.N. Security Council debating fresh sanctions, apparently did not deliberately try to keep attention away from the isles row, analysts said. The talks also came as concerns mount that North Korea will carry out more nuclear or missile tests around key anniversaries, including Saturday, the anniversary of North Korea’s founding. “Prime Minister Abe was under a lot of pressure ahead of the meeting with President Putin. The situation around North Korea has become extremely tense,” said political commentator Norio Toyoshima. “He had the daunting task of trying to convince President Putin on tougher sanctions for North Korea. He also needed to press Russia to implement the existing U.N. sanctions,” such as restricting the intake of North Korean laborers. Despite Abe’s efforts, Putin remained steady on his stance toward North Korea, maintaining that further sanctions are useless and would aggravate the situation. Before meeting Abe, Putin told an economic forum in Vladivostok that Russia intends to continue cooperating with North Korea, and repeated his stance that diplomatic means, as opposed to military pressure or sanctions, are the “only correct way” to resolve the North Korean nuclear issue. “Creating a military atmosphere and raising hysteria is counterproductive and will lead nowhere,” the Russian leader said.